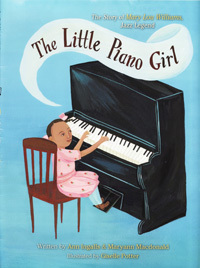 Ann Ingalls and Maryann Macdonald’s newest book is THE LITTLE PIANO GIRL: THE STORY OF MARY LOU WILLIAMS, JAZZ LEGEND (Houghton Mifflin 2010). This picture book biography leads the reader back to the 1920s when blacks sat in the colored train cars, and jazz spread north from its New Orlean's roots. Young Mary Lou moved north too, from Atlanta to Pittsburgh, and used music to overcome the bullying. “Tapping on the tabletop, she beat back the bad sounds.” But it was the piano that set her free. Mary Lou played her first professional performance at the age of 6 and as a teen began to compose, arrange and play with Duke Ellington, Charlie Parker and Dizzy Gillespie. The music is made visual by wonderful illustrations by Giselle Potter who captured the time period and the freedom of jazz. PT: What sparked your interest in Mary Lou Williams? And what about her story prompted you to write a picture book? AI: I am a former teacher. A friend, a music teacher, asked me to substitute for her as her mother was ill. My friend had been teaching a unit on jazz, something about which I have lots of interest. Though I can't play an instrument well, sing or dance, I can read a book with the best of them. I trundled off to the library to see what I could find and couldn't really find much. This was about eight years ago. So I decided I could write one of my own. Actually, I wrote two but am still seeking a publisher for the first. In the process of doing the research for the first book, I came across loads of information about the first lady of jazz and learned that she was the most prolific composer/arranger of all time! That seemed to warrant a book. PT: THE LITTLE PIANO GIRL was a collaboration. How did this collaboration come about? AI: I was so enthusiastic about this project and told Maryann, my sister, about what I had learned about Mary Lou Williams, a really remarkable human being. I wrote the first draft and sent it to her. She wanted in on this. We have written a number of other things together and sold about half of them. After that, we sent it back and forth via email and discussed it on the phone. We each handled different parts of the research, interviews, writing, seeking an agent and promoting. It's been a very successful collaboration because we really understand each other and have the same sensibilities about what a manuscript should look like and sound like. PT: What was your process? How did you work together? AI: We have always been very close. We're from a large family and shared a bedroom when we were growing up. We sing together, off key. We just click. We make very sure we understand what the other is saying and we defer if one person feels strongly about a word or phrase. It seems to work. PT: Where did you find most of your sources? Were there difficulties in locating materials? What was your greatest coup? 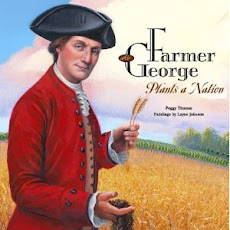 AI: We both read everything we could get our hands on beginning with Linda Dahl's and Tammy Kernoodle's books. We interviewed Peter O'Brien, Mary Lou's agent. We read liner notes, old Melody Maker and Down Beat magazines, really anything we could find. Living in Kansas City where she lived and played for about a dozen years, I have been lucky to meet several musicians with whom she played. I got some interesting bits of information that we've been able to use in school, library and museum presentations. For instance, her pet name was "Pussycat" and her favorite food was sweet potatoes with toasted marshmallows. Fun things. I suppose our greatest coup was to be invited to the Kennedy Center to sign books. When there, a toast was offered in our honor and we met two of Mary Lou's sisters and her niece. They were so touched by our work that they had tears in their eyes. Quite a memory. PT: Did your research lead you to other ideas you might consider writing about in the future? 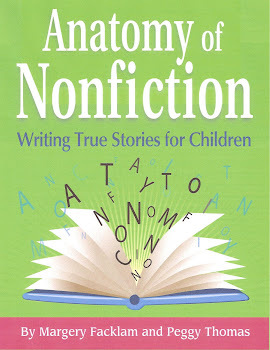 AI: I prefer to write nonfiction while Maryann prefers fiction. We both love the research that goes into our work. Maryann is beginning a new novel that will take place in NYC where she lives and I'm working on a book about Will Rogers. I write and sell lots of poetry and am always (!) on the prowl for new ideas for that. PT: From idea to publication, what was the timeline for this book? Any challenges along the way? We started LITTLE PIANO GIRL in early 2002. It took about 2 years to do the research, another year to write it and find an agent. Houghton Mifflin picked it up in the fall of 2006. Our editor, Erica Zappy, was determined to find just the right illustrator, and we think she did. That took an additional year. It finally all came together in January of 2010. People I meet who comment on the book almost always say how beautiful it is, that it's light, bright and that the children look just as they imagined. Giselle Potter gets lots and lots of credit for that. PT: I’m always curious about how other writers stay organized. Are you Neat-n-Tidy or a File-by-the Pile person? What works for you? AI: I suppose Maryann is a neater, tidier writer than I am. I'm more random and move from project to project. She tends to stay focused on one or two projects at a time. We both rely heavily on computer files, hanging files, loads of Post It notes, critique groups to keep us on track, and each other. PT: What can fans look forward to next? AI: Maryann just sold a middle grade novel to Bloomsbury. It is the story of the daughter of a resistance fighter who lived in Paris during WWII. Not sure when that will be released. I've completed a manuscript on Thomas Garrett, the stationmaster of the eastern branch of the Underground Railroad. Calkins Creek is holding that at this time. I have my fingers crossed. In the meantime, three pieces of mine are slated to be published by Highlights and Highlights High Five in May and June. Mary Lou lives on through this visually delightful "book with a beat." Thank you Ann and Maryann. 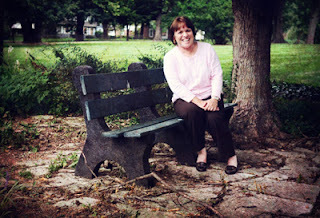 Lyrical and bouncy and lovely interview, just like Ann and Maryann's book. Thank you!